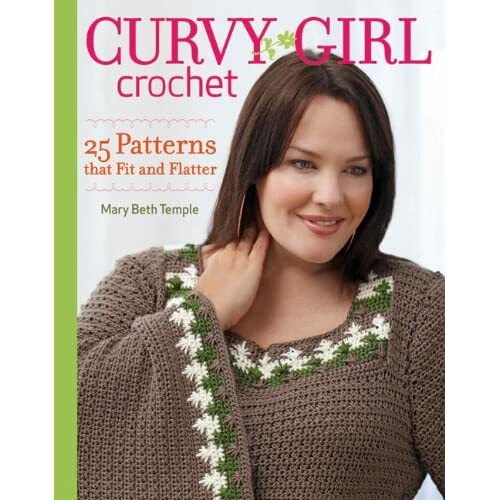 This is a book review for Curvy Girl Crochet: 25 Patterns that Fit and Flatter by Mary Beth Temple. A review copy was given to me at no cost by Taunton Press. I love Mary Beth Temple. I love her because she's funny and nice and full of personality. Never mind that she's a great designer. I just like the woman, period. Now let's talk about her impressive resume- numerous designs in major crochet magazines, her own pattern line, Hooked for Life, and authoring several books. I know her best from her award-winning podcast, “Getting Loopy,” and from chats around the internet. Needless to say, I was honored to be asked by Taunton to receive an advance copy of her latest book and review it here on Art, Like Bread. When you start to look at pattern books and magazines, how do you begin? Do you read from cover to cover, skip around and look at the pictures, or scan the contents for garments and projects to your liking? I am one that goes straight to the project index in the back to see if anything catches my eye. Then I go right to my favorite patterns and see what they require as far as yarn, hooks, and skills go. Then I look more carefully at all of the patterns and consider each garment or piece in my life, or with whoever I would make it for. Over time, I decide to dig in and make one. For me, the real eye-catchers in this book are the Wrapt Top (p. 118), The Progressive Tunic (p. 35), and the Essential Pullover (p. 20). Trust me, these top three picks were hard to choose, because there are many wonderful patterns in the book. As the patterns I mention become available on Ravelry, I'll link them up here. Here's the really cool part: I may even be able to crochet the SMALLEST size in the book! Everything is sized from L - 5X. I feel so tiny! hahah. But seriously, this is wonderful, because I remember when I first started to crochet, I had such a problem finding patterns that I could make for myself. I've since lost weight but I have a while to go still. But even if I do lose more weight, I can still crochet the stuff in this book because MBT includes two brief but info-packed chapters about the essentials for molding the pattern to your body. As much as I don't want to admit it, it's so worth it to go those extra miles to make your garment fit! I've had a sweater disaster and a tunic success in my past, and taking the time to swatch, carefully consider drape when it comes to yarn subs, and measure as you go make all the difference when it comes to having a wonderful final product. Since these projects are ones you'll want to keep in your closet for years, it's great to have these tips and techniques to plan for a success from the very beginning! I'm all about this book, so watch my Ravelry Project page for my progress. As soon as I get my hands on the perfect DK, I'm so crocheting that Wrapt Top! You want the cuteness, don't you?